Choose your Catalog number you prefer with initial membership. ​See Past Society Catalogs page for selections. Society Members Newsletter #40 coming soon! Membership $25.00 plus $6.70 priority mail charge. 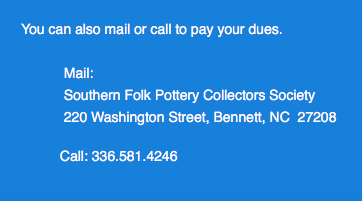 Receive notices of upcoming Auctions, Events, Billy Ray Hussey Kiln Openings, periodic Newsletter, and Pottery offered exclusively for Society Members.